Jarrow Formulas Joint Builder is based on a combination of key ingredients with well known reputation for treating aching joints. Glucosamine, MSM and vitamins can be found in this health supplement, and the tablets are easy to take and to be absorbed by the body. Since painful joints can prevent you from leading an active, healthy lifestyle, it is very important to care for your joints, especially as you age. Jarrow Formulas Joint Builder looks like a good adjuvant for treating joint pains, and for increasing their flexibility. Here is some more information on the product so you can make an informed decision. What Does Jarrow Formulas Joint Builder Contain? While the composition of this product is based on the reputable glucosamine sulfate, we notice that it does not contain chondroitin, as well, which is an overlook, since the two work together enhancing each other’s effects on relieving joint pain. Also, we see no hyaluronic acid in the formula, which is another great ingredient to have in a joint health supplement. The manufacturer recommends taking two tablets per day, or as indicated by your doctor. The listing price for a bottle of Jarrow Formulas Joint Builder, with 120 capsules, is 25.95USD, which is a good price, seeing that one bottle will last for two months. There is no clear guarantee offered on the manufacturer’s website, but you can contact the company in case you are having issues with their product. It may also be possible to get a refund from resellers, based on their own policies regarding returns. 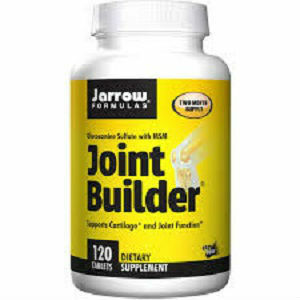 Since it is based on the powerful glucosamine sulfate that greatly contributes to rebuilding cartilage and synovial fluid, Jarrow Formulas Joint Builder sounds like a great product. It is reasonably priced, and it also contains other ingredients that are known to improve joint function and relieve pain. However, the formula is far from being complete, since it does not contain hyaluronic acid and traditionally used herbs for treating conditions affecting the joints. Mark Stevens	reviewed Jarrow Formulas Joint Builder	on October 21st	 and gave it a rating of 2.